Travel Club is an exclusive service for year-round residents of Scilly. It gives you discounts on travel, and the chance to book short-notice standby seats – so you can hop over to the mainland, when you need to, for less. Membership is free, and gives you a discount on travel on Scillonian III and Skybus, year round. After almost a century’s service to the islands, it’s our way of thanking the community. What does Travel Club membership give me? Travel Club members can claim 15% off travel on both Scillonian III and Skybus from mid-March to October. When the Scillonian III isn’t sailing (from early November to early March), the Skybus discount doubles – giving you 30% off fares. Members also have exclusive access to a standby rate of £51 per adult for same-day and next-day Skybus flights from Land’s End Airport if booked after 3pm. Who can join the Travel Club? Because the Isles of Scilly Steamship Group subsidises the Travel Club, we can only offer membership to full-time, permanent residents of the Isles of Scilly. To apply to join, you need to have been a resident of Scilly for at least 12 months, and have your main or family residence on one of the islands. Island residents studying on the mainland can join too — a family member can complete an application on your behalf (we’ll just need to see your student ID and a letter or email from your college or tutor). Download one of our application forms, fill it out, and drop it into our St. Mary’s office — we’ll take care of the rest. When we process your application, we might need to ask for evidence to support your claim. If you’re a member of the Armed Forces, don’t forget to present your military ID when you apply. We consider every application on a case-by-case basis, but usually you’ll be ready to start travelling within 14 days. 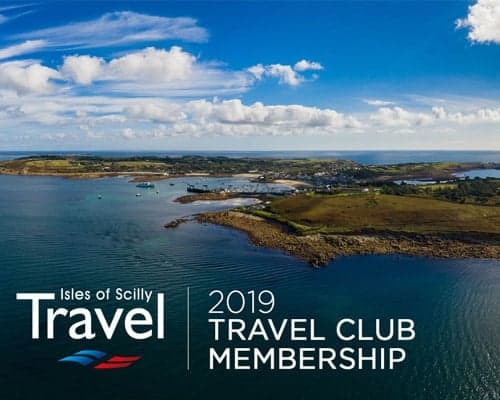 Booking tickets on Scillonian III and Skybus with your Travel Club membership is simple — either pop into any of our travel centres and show us your membership card, or call 01720 424220 and quote your membership number. (Keep this handy – without it, you’ll still be charged the full amount for your journey.) Soon, you’ll be able to book your tickets online, too — keep an eye out for news about our Travel Club booking portal. Don’t forget your membership card when you travel: you’ll need to show your ID to the Scillonian or Skybus staff at check-in. (Otherwise, you’ll need to pay the full fare for your journey, or you may not be able to board.) Stand-by travel is available for booking from 3pm on the day before you travel (unfortunately, we can’t hold seats). You won’t be able to use your Travel Club membership in conjunction with any other reduced fares or special offers. All bookings are subject to availability and all our other standard terms and conditions of carriage apply — these are available on request and can also be found online, here. I’ve booked a ticket on Scillonian III, can I travel on Skybus instead? Of course — as long as a seat’s available. You’ll just need to upgrade your ticket to the Skybus Travel Club rate. If you need to change a Travel Club ticket, there’s a small fee of £5.00 per person, per route and we’ll need at least 24 hours’ notice. Changes made to tickets within 24 hours of the scheduled departure time will be charged again at the full fare. If you need to cancel your ticket, just get in touch. To have your ticket refunded, you’ll need to cancel with at least 48 hours’ notice, and pay a cancellation fee of £10.00 per person per route. Unfortunately, we’re unable to refund tickets cancelled within 48 hours of the scheduled departure time, because it’s not likely we’ll be able to re-sell the seat. What if my journey is cancelled or delayed? If we have to cancel your journey for any reason — such as bad weather or technical issues — you can either use the alternative transport we provide, or receive a full refund. We do everything we can to minimise disruption to travel on Scillonian III and Skybus – but any offshore island destination can sometimes fall prey to to factors like changeable weather conditions. We therefore recommend considering travel insurance to cover you, just in case.